Our remarkably efficient RTT-12 electric tow tractor will tow up to 12,000 lbs. The tow tractor has a fully adjustable seat for both stand-up and sit-down operation while going mobile. The RTT-12 also includes an optional "smart charge" battery and charger that allow for occasional charging at shift changes and breaks to provide three shifts of service without having to constantly change batteries. 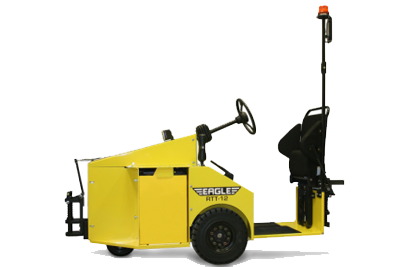 Get a quote on the EB2-5 electric tow tractor and other industrial tugs today! Load Type Ideal for towing loads up to 12,000 lbs.